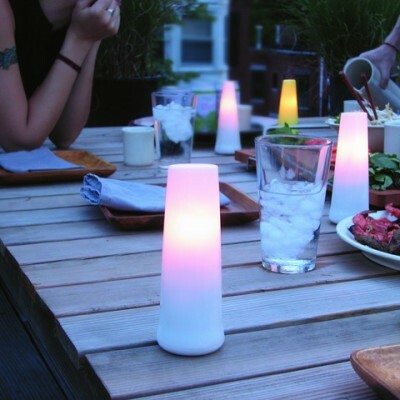 The Candela Eco Lights are a set of 4 eco-friendly lights that mimic candles. These low energy rechargeable lights use LEDs to provide the illumination, providing a soft and appealing light similar to that of a candle without any fire dangers or issues with lighting. The Candela Eco Lights have been created to provide beautiful low energy lighting. Designed to mimic candles, the lights are perfect for those who want a warm soft glow either for intimate parties or as a safe night light. The lights are supplied with a charging plate, when lifted from this the lights automatically illuminate, when placed back when not in use each light will recharge itself so it is ready for use when you require it. The lights will automatically turn on if there is a power cut, ensuring you have a light source without any worries over lighting candles or locating a hidden torch. The Candela Eco Lights will provide you with up to 8 hours illumination when fully charged, it can take up to 16 hours to fully charge the internal rechargeable batteries. You can turn each light off or on as required allowing you to be able to transport fully charged lights with you should you wish, allowing you to use them to provide lighting while out camping for example, or for a child to take with them for a sleep over as a night light. The Candela Eco Lights are a safe light that can be left alone unattended unlike the candles they mimic. By using LEDs the lights provide you with long lasting illumination while requiring very little energy. The Candela lights are a great gift for any who enjoy candle light, for children or for those who want a practical light that can be used in an emergency. 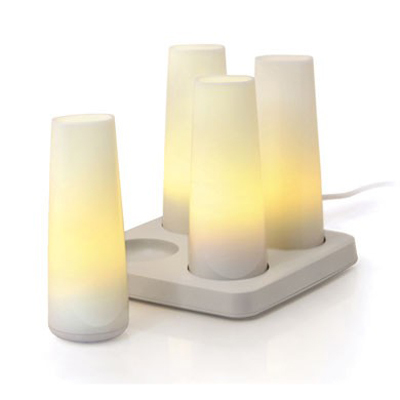 The Candela Eco Lights are just £81.70 with free UK delivery.